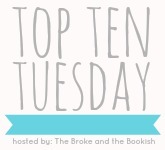 This week's Top Ten Tuesday question asks, which 2013 debut novels are you most looking forward to reading? I love discovering new authors from their first published book & am very eager to experience each of these stories. Pretty much we need to read Nantucket Blue together when it comes out!! That one is just AHHH I NEED IT. Between my list on The Perpetual Page-Turner and TBTB we have SOOOO many in common but that's kind of a given? haha. Haven't ever heard of That Time I Joined The Circus though so you can bet I'll be taking a look at that since it's on your list! Glad to see so many contemps on here!! My writing partner and I are hoping this is the year of YA contemporaries :-). I feel like there aren't as many contemp debuts this year as last, but nonetheless the ones you have listed look great! Great list! I'm really excited to read 45 Pounds and That Time I Joined The Circus, the sounds really good. Awesome list!! I also can't wait for Between the Devil. It looks so good! I'm really excited for Nantucket Blue too! Sounds like it has the potential to be so good! Nobody But Us also sounds really intriguing and I'm excited to get my hands on it! Great List! I'm looking forward to Between the Devil and the Deep Blue Sea, How My Summer Went Up in Flames, That Time I Joined The Circus, Reboot and The Art of Wishing as well. Nantucket Blue is on my list as well, it just sounds like such a great summery read. Other ones I'm excited for are Reboot, Nobody But Us and Between the Devil and the Deep Blue Sea (I mean, even that title is amazing!). Your list is fantastic! There's so many on here that I'm really excited to read, especially Nantucket Blue. 45 Pounds (More or Less) is one that I am definitely going to have to read when it's released. I'm really looking forward to several of these, but for some reason I'm particularly intrigued by That Time I Joined the Circus. I haven't really seen it mentioned much, but the premise just seems so great. I find circus life fascinating, so I think it'll be a really interesting contemporary.